"I'm a country cook," she had said. "Nothing fancy." Nothing fancy meant getting 3 meals a day on the table for a family of 11. The meat, the starch, the vegetable.... the bread. My head spins and swims thinking about it. Doris grew up on a farm in Cambria, Wisconsin. Homework was done by the light of kerosene lamps. When electricity finally did come, it went to the barn first to help with the milking of the cows. 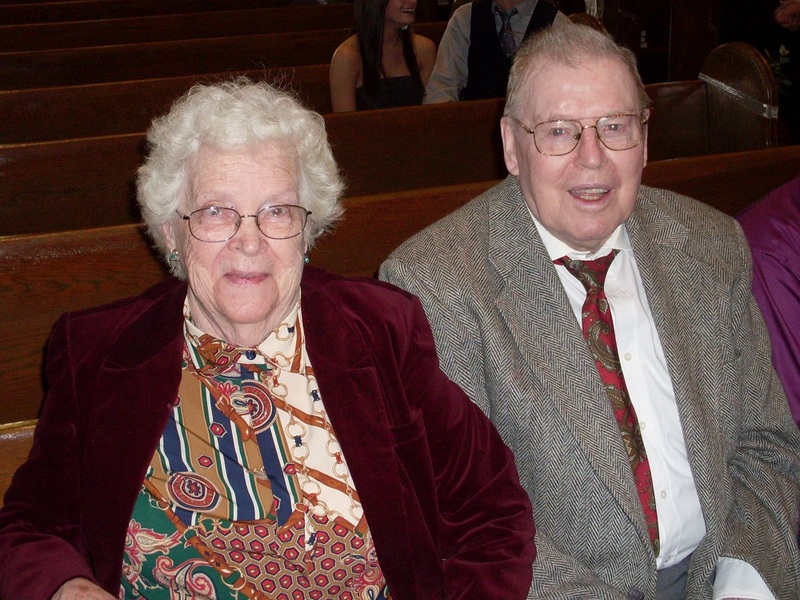 (Grandma and Grandpa Haas at their grandson's wedding in 2010). Doris went to school in a one-room schoolhouse. And one thing she knew - she wanted out of Cambria. She wanted the city - where nobody cared about your business. And so she found herself in nursing school in Chicago - working the emergency room. That was an eye-opener! There are smiles when she recalled her courtship with Roger. They hadn't been dating that long when she asked him, "Is this going anywhere because I don't like to waste my time." She soon had a ring on her finger and it worked - over 60 years of marriage. Yes, we recently lost her. But her legacy of stories, cooking and good humor continues with her children, her 18 grandchildren and her 8 great-grandchildren (with one on the way!). We miss her and we find her unexpectedly - through memory, through cooking, through family. She'd like this recipe. You will, too. It is "country cooking" at its best. An apple cake - loaded with apples, just sweet enough for smiles and just fluffy enough to deceive you into think there are no calories associated with it. 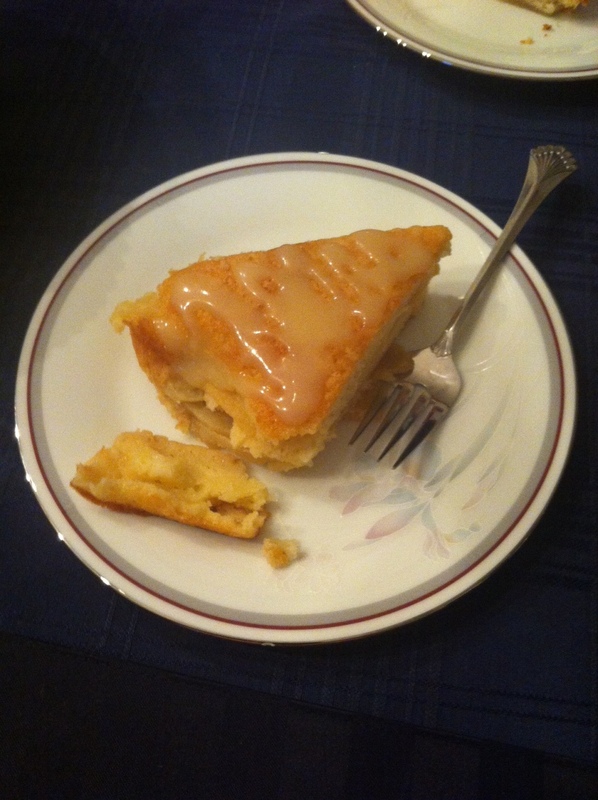 The caramel sauce is thin and drizzly and dresses this French-country-cooking-apple-cake into something more elegant. I first saw this on Bon Appetit and noted it. I later saw it on Ciao Chow Linda's blog and bookmarked it! Linda's salted caramel sauce is a bit thicker than mine so do check it out. And do make this before apple season is over! I have evolved into a fair country cook. I think it is inherent in all Italians - used to peasant, somewhat poor cooking and looking to use what's available. And what's available in October in Minnesota - are apples. Glorious apples. If you like Honeycrisp and Sweet Tango - you can thank Minnesota for them. They were developed at the University of Minnesota Twin Cities and all Minnesotans sing its praises and head to the orchards. The apples are first sautéed in butter (did I mention it was French and they do that a lot) and the richness of that step keeps the cake moist and the apples just a wee bit caramelized - and who minds that? Place rack in middle of oven and preheat to 350°. Butter and flour an 8 inch cake pan. Heat 2 Tbsp. melted butter in a large skillet over medium heat. Add apples, sprinkle with 2 Tbsp. sugar, and cook until apples are golden brown, 10–12 minutes. 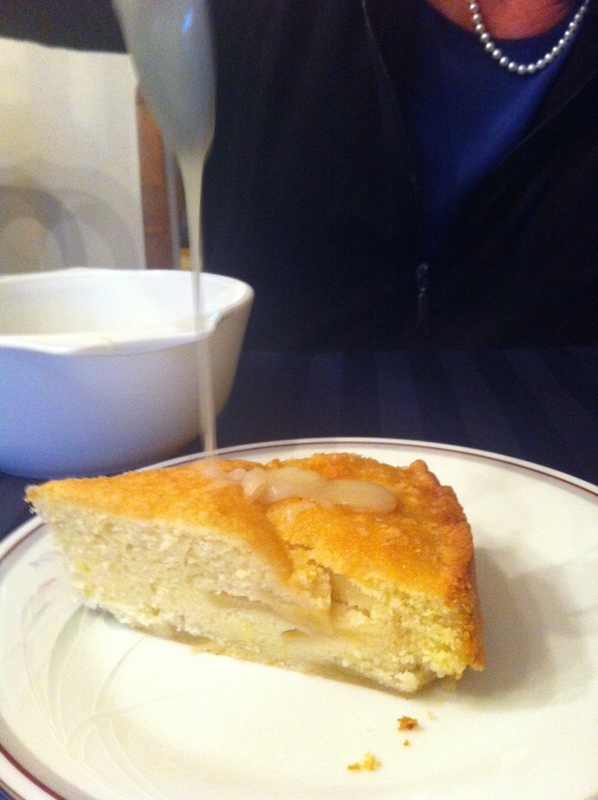 Arrange half of the apples in the bottom of prepared cake pan so most of it is covered. 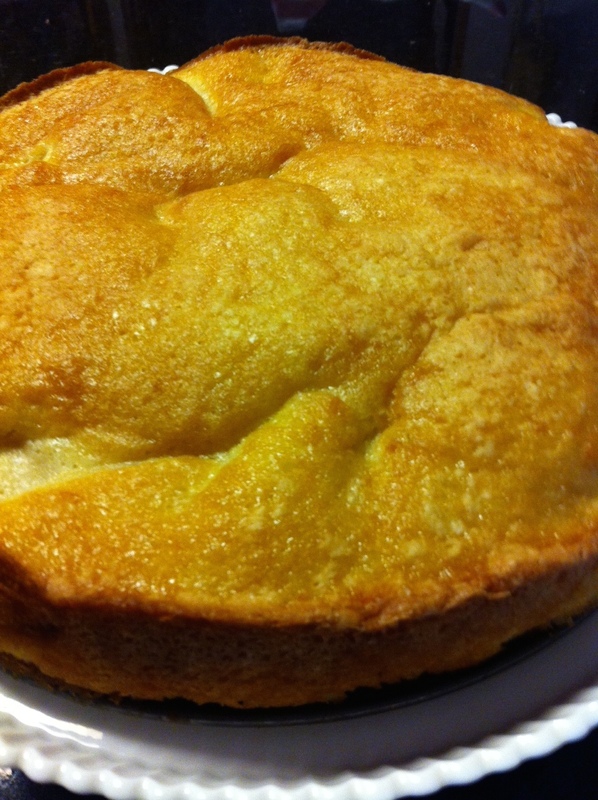 Whisk baking powder, salt, lemon zest, 1¼ cups flour, and remaining 1 cup sugar in a large bowl. Whisk in eggs and remaining 10 Tbsp. melted butter until smooth. Can be made ahead - cover tightly in clear wrap. But I think it's really grand the same day. Rewarm the caramel sauce if made ahead and serve. And by all means - if the spirit moves you - dollop on the creme fraiche. The crust did not fall off. My husband cut into it and then I made him put his fork down so I could snap one last photo (this went fast). That happens a lot around here! I have been thinking of the evolution of my blog. Seven years ago I started it to connect with the foods of my childhood and the foods of my family that came before me. Today, I am looking at simpler fare. A little razz-a-ma-tazz thrown in once in a while because - it's theatre! I'm not sure where it's going or if I'm on the right track - but blogs need to change don't they? They're personal. And as the seasons and day-to-day-living changes, I am realizing that our blogs reflect that. Do you ever look back at your early postings and think - how different everything was?